TRAVIS TRITT - Grammy award-winning artist Travis Tritt is scheduled to perform at Charleston Coliseum on April 12. The performance is one of the many stops on Tritt’s stateside tour, which has received rave reviews from concertgoers and critics alike. Tickets range from $39.50-$65.00 and are available for purchase at the Charleston Coliseum box office or online at ticketmaster.com. Nearly three decades after Travis Tritt launched his music career, the Grammy award-winning artist continues to sell out shows and stay true and relevant to Country music fans across the globe. A Marietta, Ga. native, Travis Tritt is dubbed one of “The Class of ‘89,” which included Country music superstars Garth Brooks, Clint Black and Alan Jackson; all of whom dominated the charts in the early ‘90s. Among his eleven studio albums and numerous charted singles are nineteen Top 10 hits, including “Modern Day Bonnie and Clyde,” “Here’s A Quarter” and “It’s A Great Day To Be Alive.” His career has produced millions in album sales, two Grammy award wins and multiple No. 1 singles on the Country radio charts. This month, Tritt will appear as a celebrity panelist on the USA Network series REAL COUNTRY, premiering Nov. 13, alongside Shania Twain and Jake Owen.In each hour-long episode, Twain, Owen, and Tritt will hand-select emerging solo artists, duos, and groups to perform in showcases that spotlight the rich traditions, songs and themes of specific country genres. The best artists from each showcase will perform in a grand finale, for the chance to be named one of country music’s next breakout acts. 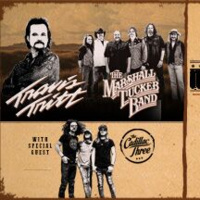 For more information on Travis Tritt, visit his website TravisTritt.com and follow him on Twitter, Instagram, and Facebook. MARSHALL TUCKER BAND - In the early fall of 1973 The Marshall Tucker Band was still a young and hungry group out to prove themselves every time they hit the stage. Their debut album had already spawned numerous hits. Today the band records on its own RAMBLIN’ RECORDS Label (distributed by Sony / RED) and continues to release new and previously unreleased material.